The soft grip handle adds comfort and security. Especially suitable for masonry paints & exterior treatments. 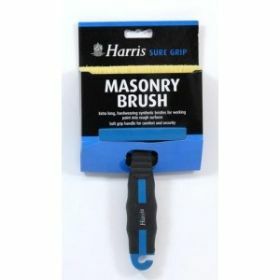 The Harris brush Size: 125mm | 5"
This brush has extra long, heard wearing synthetic bristles for working paint into rough surfaces, the soft grip handle adds comfort and security. Especially suitable for masonry paints & exterior treatments. The handle incorporates a clip for holding the brush onto the edge of a paint tin.